2015 saw the club return to Treetops high on the cliff near Combe Martin once again and the view was just as stunning! Although we had stayed here in 2014, we still had ten of us in the house, and another two members stayed locally. The weather was variable with Saturday being the better day and everyone joined in with providing and making the meals as usual. The main reason for our return to Ilfracombe was a desire expressed last year to visit Lundy Island and Saturday was put aside for this. After a ‘moderate’ crossing time was spent exploring this fascinating place now owned by the National Trust and administered by the Landmark Trust. 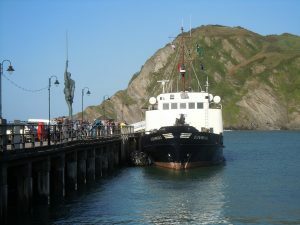 In fact, we chose the 50th anniversary of the Landmark Trust unbeknown to us and got a discount off of the ferry price! The evening meal was at the Thatched Inn in Ilfracombe. The Sunday morning minibus taxi took all of us to Lynton and Lynmouth, where time was spent exploring the two centres connected by a water-powered cliff lift.